When delegate successfully completes the 2 year Restorative & Aesthetic Diploma programme with British Academy of Restorative Dentistry in Dubai and completes the 3 assignments set by City of London Dental School (CoLDS), then they are eligible to apply for "With Advanced Standing" to the third year of the “MSc (Clin) in the Specialist Practice of Restorative and Aesthetic Dentistry”. Additional assignment fees for the 3 assignments apply equal to 5% of the total payment for the Diploma Course. Delegates will be required to complete a dissertation and attend 4 days worth of lectures in the final year of the “MSc (Clin) in the Specialist Practice of Restorative and Aesthetic Dentistry”. Attendance does not need to be in the UK and small group sessions can be provided. If you require more information about the MSc (Clin) please directly contact Prof. Steward Harding who is the Dean of The City of London Dental School (stewart@cl-dental-school.co.uk). What do the 3 assignments entail? You will need to complete 3*1500 word assignments over the full Diploma programme on a topics related to a course. The pass mark is 50% and you will be permitted one retake. You will need to set aside 15 to 20 hours of your time to complete the assignment for which you will be given 2 to 3 months to complete. Over the 2 years you will need to submit 3 assignments. Apart from the assignment fee which is calculated as 5% of the current full Diploma cost there will be no additional charges related to assignment submissions and examiner feedback or resubmission of failed assignments. This fee is payable in full before the assignments will be issued, staged payments are not acceptable. What happens if only two years are completed? Providing all the related course work has been submitted and assignments completed a Diploma will be awarded by The City of London Dental School on completion of year two. Will the degree certificate mention part time or distance learning? The Diploma or Masters will not mention the type of delivery only the title of the programme and year of award. 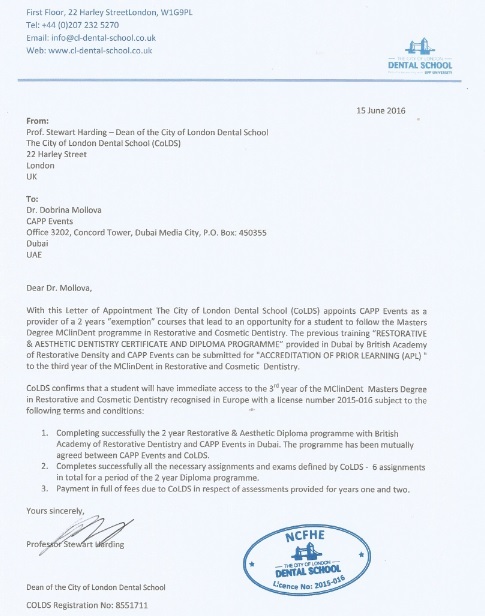 Is the program accepted by GDC (UK) as an additional qualification? The GDC no longer accredits any MSc programmes as additional qualifications. Does the program give any credit for the entry to MRD exam? Students will need to be confirmed directly with the relevant Royal College or Institution. Will the “MSc (Clin) in the Specialist Practice of Restorative and Aesthetic Dentistry” be accepted a specialism? Students will need to be confirmed directly with the relevant authority. What is the cost of the “MSc (Clin) in the Specialist Practice of Restorative and Aesthetic Dentistry” year (meaning the 3rd year after I complete the Diploma)? The current cost for the last year is £10,000 paid directly to the City of London Dental School with which you will be registered as a student. Is it possible to defer entry to the MSc year? It is normally possible to defer entry by 2 years. After this time it may be necessary to retake modules which will incur additional fees. After successful completion of the Restorative & Aesthetic Diploma by the British Academy of Restorative Dentistry in Dubai, you can progress onto the pathway for the MSc (Masters of Science) in Restorative and Aesthetic Dentistry with The University of Manchester and Healthcare Learning. The MSc is part-time, flexible online distant learning. Students from the Restorative & Aesthetic Diploma in Dubai have the option for the residentials to be covered locally. Dentists that do not complete the Diploma, will have to do 3 visits of 4 days over the two-year period which costs money and time. Nevertheless, you can choose the option to still visit the UK and do the residential sessions. The two year Diploma course in Dubai takes dentists to the next level, allowing them to take on more complex cases. The related theory of the Diploma will help a delegate to pass the theory modules of the MSc much faster and easier. More information: Link 1 and Link 2.